Robotic process automation (RPA) is rapidly changing the accounting and finance operations, arguably faster than any other piece of modern technology. But a question remains. Why? Why is RPA becoming so popular? Why is it making robotic accounting a term to follow? Just for starters, it can be used to reduce data transcribing tasks by 80% in accounts payable, financial close, tax accounting and more. Robotic accounting is an increasingly popular solution for the limitations of legacy and disparate systems found in the finance and accounting operations, which have had a direct effect on the operational efficiency of back office finance operations and internal customers of shared services functions. Robotic accounting, or robotic process automation in accounting, is defined as the use of automation applications, like UiPath and Blue Prism, to reduce the amount of human labor required to process accounting and finance department transactions. What does that mean in plain English? Just think of “accounting robots” as a tool that can reduce the effort needed to move routine data between different accounting systems and outside applications, instead of just being confined to one. Accounting RPA is often perceived as a human replacement, but accounting robotics is more of a “bionic arm” that can help finance and accounting operations staff process work faster by reducing data movement work. Software applications like UiPath, Blue Prism, and Automation Anywhere (who just got $250 million in funding last week, wow!) have simplified the work and skill required to create an artificially intelligent accounting workforce, a.k.a. robotic assistants by removing the need to understand computer code to integrate data movement in between multiple data sources. Remember that old slogan, “There’s an app for that!” Well guess what? Finance and accounting staff can now say that about RPA. There is an app that can remove all the copying and pasting of data in between different applications. Robots in accounting and finance are similar to Excel macros. However, the key difference between them is that instead of being limited to the macro running only in Excel, RPA software runs across any accounting application that you point it to. Think of RPA as a macro that can tell three applications what to do instead of just Excel. Robotic process automation in accounting is also often referred to as AI (artificial intelligence) and machine intelligence. 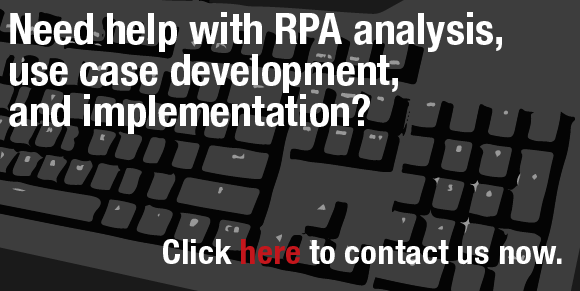 They’re interchangeable for a reason, as they all refer to the RPA process. Most RPA providers for finance operations try to make the technology sound complicated to build hype and the sales interest of CFOs and leaders of accounting departments. But don’t be fooled. RPA is much simpler than you might be led to believe. Let’s break through the technology-consulting jargon to talk about finance and accounting robots (robotic process automation) in a simple way. RPA by itself is not a magic bullet or stand-alone solution for modern business process improvement in finance operations. But, if you’re careful to pair it with the right depth finance department process analysis and work standardization before implementing it, RPA can yield benefits far past any new system infrastructure implementation, in 3-6 months – not 3-4 years. Benefits of RPA are different from traditional system integration. How? Well, RPA bridges the gap between disparate applications – it really is “the last mile” of process automation. Where most large finance system implementations like SAP and Oracle fell short in terms of straight through processing, robots integrate at the micro-task level where the big systems could not. The result of robotic accounting includes reduced labor costs, cycle times, increased accuracy and simplified workflows. Customizable workflow. RPA in finance and accounting is not confined to one part of a process – it can be applied to multiple processes at one time; accounts payable, accounts receivable, financial close, controller work, financial planning and analysis, expense management, and even tax. Nonstop performance. Finance and accounting RPA has no working hour limitations. They can run 24/7/365, increasing productivity to levels traditional work can’t reach. Consistency and reduced errors in work. Robotic accounting excels at error free data movement with reduced output variability. Major lifting. With robots in accounting taking care of slow data entry type work, human workers are free to tackle high value work where they’re truly needed. You wouldn’t think it, but robots can actually make humans happier! Ease and speed of installation. A robot can be installed in less than a week. But – you have to do that analysis to figure out the best bang for your buck in terms of where to install them in your accounting operations first. What is a RPA use case in finance and accounting? Robotic process automation use cases in finance and accounting are defined as documented actions, or steps, of a process, that are opportunities to implement RPA. These are documented at the front-line employee level by capturing the work steps undertaken on their computers or other electronic end-user devices. Finance and accounting RPA use cases facilitate the preparation needed for automation of information movement across systems. Complicated? It doesn’t have to be. Think of use cases as finance and accounting operations process blueprints used by consultants to set up automated scripts for data processing across multiple IT systems. This detailed finance and accounting use case example explains how to use robotic process automation (RPA) to automatically upload invoices to a Sharepoint website to be paid. Cathy works in Accounts Receivable, and she’s responsible for uploading her company’s invoices to a Sharepoint website for their customers to pay. She normally processes each invoice manually, which takes 5-10 minutes per invoice depending on the customer. In the current-state (pre-RPA) process, she has to separate Excel files from xml files (in a folder created automatically by SAP), zip the xml files (invoices) and then upload these invoices to a Sharepoint website for their customers to access. SAP automatically saves invoices to a specific network folder, depending on the customer. Cathy opens Explorer and navigates to the folder created for today’s invoices. She selects all xml files, being sure to not choose any Excel files. She zips these xml files into one folder. While Windows zips the folder, she waits. When the folder is zipped, she navigates to the appropriate website to upload the files. She logs into the website. She uploads the newly created zip folder containing the invoices to be paid. This is tedious work, performed by multiple employees every day for numerous customers. Cathy starts the UiPath AR robot. UiPath asks Cathy to choose the correct folder for today’s invoices (folders change daily). UiPath then automatically navigates to the folder that Cathy has chosen. UiPath searches for and then selects all xml files. UiPath zips all xml files to one folder on the desktop. A pre-set delay allows Windows enough time to zip the folder (zip time depends on the number of files). UiPath then navigates to the company’s invoice site, logs in with Cathy’s username and password, chooses “upload file” and uploads the zip folder full of invoices. After uploading, UiPath deletes the zip folder from the desktop to reduce desktop clutter. The above steps (1-9) only took a few clicks of a button compared to the 50+ clicks required before RPA. It used to take Cathy 5-10 minutes to zip and upload invoices, but now it takes her 2 minutes—saving an average of 7 minutes per invoice. Cathy used to spend a large portion of her day just zipping and uploading invoices. Now she has time to focus on more important matters. With RPA, she can “set it and forget it.” The AR robot does most of the work for her. Don’t believe it? This is an actual case and robot that we built and implemented for a client. We have video proof of before and after! Sounds like something that you might want to try out, right? As with any new frontier, most finance operations executives struggle to look past their legacy systems and find places where RPA opportunities can be implemented. That’s where use cases come in – and we have thousands of them. Accounts payable RPA use case example – Vendor invoice processing cycle times were reduced by 60% by implementing a robot that aided accountants with the transcribing of inbound invoice information from PDFs (invoice number, data received, and dollar amount) into web-based SAP, internal use spreadsheets used for reporting, and by placing a final PDF copy on a local server to maintain SOX compliance. Controller function RPA use case example – Manual work time required to process weekly invoice data feed validation comparisons to previous week invoices received were reduced by installing an accounting robot that automatically reconciled the current period feed against the last period once the controller opened the file. The robot then spit out any exceptions or rejections that required human review if they did not reconcile automatically. Financial close and reporting RPA use case example – Baseline 10K and 10Q report creation processes were improved by implementing RPA that automatically processed tax entries into Quickbooks from spreadsheets received from business units – reducing manual copying and data transcribing tasks of finance managers by 85%. Accounting reconciliation RPA use case example – the exception review process required reconciliation of accounting data from Quickbooks, multiple Excel sheets, and customer invoices. RPA was installed as a bridge between the three data sources to automatically compare the invoice discrepancies in less than 1 minute compared to the 30 minutes it took prior. 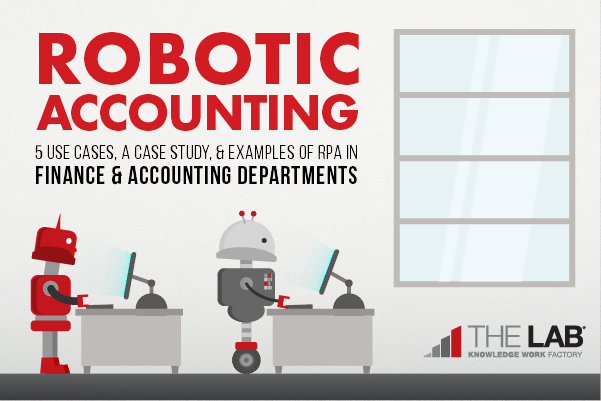 Let’s set the scene for robotics in finance and accounting with a robotic accounting case study: a day in the life of Jane, an accounts payable clerk. Jane has Quickbooks, Excel, a PDF invoice from a customer, and Outlook open on her computer. We’re sweating just from talking about it! Jane’s work life could be easier if she sat down and analyzed the process just discussed above, documented the accounting work flow, and figured out exactly what fields had to get copied and pasted from each application into the other. Add to that the ability to make the copying and pasting happen automatically? Well – that is exactly what a very basic use case for robotic process automation in finance and accounting operations sounds like. 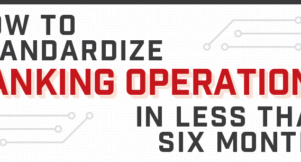 You can remove literally all the copying and pasting work if you dedicate some time to standardizing the process and then putting an RPA action on top of it. Let’s rewind time a bit and start the whole scene over, but with RPA installed. Let’s say, UiPath since that is our RPA software of choice at The Lab. In this new reality, the robotic accounting bot can find that initial PDF in Jane’s Outlook. Jane’s software robot helper can navigate through multiple screens (even taking control of her mouse and keyboard) to copy and paste everything into its appropriate documents. It can even send the final confirmation email, reducing Jane’s workload considerably while increasing overall AP cycle times. Now imagine that across an entire organization! 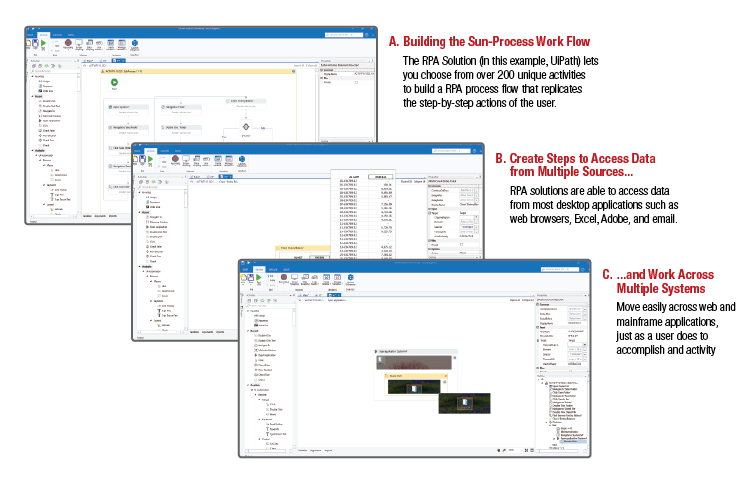 This is an example of unattended RPA, meaning the whole process has been automated. These are a lot harder to do compared to an “attended” solution. A simplified “quick hit”, but no less effective, version of robotics in finance and accounting can greatly affect your organization is known as “attended RPA”. This means that a robot is basically installed as an assistant compared to being installed as a human replacement. We call it the “bionic arm approach.” Think of this approach as crawling (or taking your first steps) before breaking out into a steady sprint. In this approach, Jane would still open her email and the necessary attachments herself, after which she would turn on her robotic accounting software which would move the data to where it needed to go for her. At The Lab, we like to take an attended RPA approach to our implementations. Making a worker more productive by giving them a “bionic arm” is much faster to implement and allows for greater flexibility in the future when compared to trying to automate away entire job positions. Robotic accounting implementation: Don’t automate until you standardize processes! Implementing RPA in finance and accounting doesn’t have to be difficult, even if it might appear so at first blush. But you have to call us for help. Of course, you can’t just throw a robot at one person’s spreadsheets and call it successfully implemented RPA in finance and accounting. Ultimately, the best approach will be to scale up process and data standardization across multiple FTEs first. After that, introducing RPA to major processes is much less likely to break the bank or take more than a few months. Let’s walk through how a process standardization and RPA analysis project in finance and accounting should play out. Not all finance and accounting operations work streams are created equal for the purposes of RPA. The first step to any accounting and finance RPA project is identifying a manageable scope of processes that would benefit from robotics. Remember, start small, then scope up out. Thinking big before doing any pilot testing can leave you open to more rework and developer costs. Remember, first make a bionic arm – not a full Iron Man suit. Common functions in finance and accounting that benefit from RPA include: Accounts Payable, Accounts Receivable, Accounting & Reporting, Budgeting & Forecasting, Expense Management, Internal Audit & Compliance, Tax, Treasury Management, and Payroll. Accounts payable, with its repetitive work, tends to lend itself better for robotic accounting than a process like budgeting, which requires a lot of human estimation. In our experience, we’ve found that starting with a pilot scope to minimize risk and generate buy-in is best. Starting with two or three work streams out of the entire finance department works well compared to doing the entire thing at once. When you succeed at smaller scale, you can then invest in rolling it out to a larger group. The main takeaway for this step? Start small. Get a feel for how your organization, and your workers, respond to robotics in finance and accounting. Learn about the cultural response to RPA, and then you can scale up. Without the initial operating cost for the accounting function in scope for RPA, how can you determine the financial benefits and business case for implementing robotics? That’s why step two of a robotic accounting project is always setting the baseline cost of running the accounting operations. The easiest way to convince shareholders and the C-suite that RPA needs to be implemented is by showing how it can benefit an organization financially. Times, and technology, might change, but money always talks. Grab a laptop, a note pad, or your note-taking object of choice and get ready to sit at an accounting or finance worker’s desk all day long. That’s right, you’re getting down and dirty in the weeds during this step. You’re going to need to take note of every single mouse click that they do within the applications you are wanting to use RPA on top of. Or, you can go the OpsDog route and do these “day in the life of” observations using screen sharing software like GoToMeeting or Webex. We prefer screen sharing software since it doesn’t require on-site consultants, lowering the cost of a project. Regardless of how you do it, you should analyze enough workers in the finance department to get a good sample size of RPA improvement opportunities across the entire in-scope group. When you’ve figured out exactly what the accounting work flow is and what the screens that need robotic accounting look like, use process mapping software like Microsoft Visio to visually represent the processes in scope. Remember, you need to document all the way down to the screen click and copy/paste level detail or you’re just wasting time. No one wants to be stuck in a reanalyzing loop. Make sure that you document using BPMN 2.0 stencil, as that is the standard for IT folks. This format is easiest to hand off to the RPA implementation team when the analysis is complete. If you’re thinking about robotics in finance and accounting without first being ready to analyze and standardize manual processes, we have some advice: don’t. This is the lifeblood of robots in finance, without which they can’t do their jobs. This is where things get difficult and real finance transformation work comes in to play. The hardest part of making a successful accounting RPA project is rolling it out at scale. Saving a few minutes of one worker’s day is great, but unless you uniformly roll out the work to an entire group, the financial benefits will fall short. That’s why you must standardize the work of the entire scope in play first. Accounts payable worker A being analyzed most likely doesn’t copy and paste screen or fields in the same order as Accounts Payable Worker B. And who knows how Worker C does things. You must implement work standardization for the entire group at the same time as you’re implementing the robots. Rely on your project managers with lean and Six Sigma experience. They have the experience with standardizing processes at scale necessary for projects like these. RPA software is new and hot. But it is hot for a reason – it is not going away. If you can’t beat them, join them. Personally, we suggest that everyone get their hands on the Community Version of UiPath just to test it out and understand it. Like all new software, it has a bit of a learning curve but you can cut it short by watching some training videos on Youtube. Or even better, take an RPA certification class to get a leg up on your resume. Now, remember, simply understanding a software application doesn’t mean you’ll be able to use it at scale without doing some serious scoped up analysis. Not feeling the DIY mood? If you don’t have change management experience, lean process improvement experience, or some type of other operations consulting work in your background, don’t bite off more than you can chew. Better call in the pros to help. At the same time though, not all RPA vendors and consulting companies are created equally. Which is the best RPA vendor? There are two walks of life on the RPA vendor consulting side. There are consulting firms that can help you analyze and build a business case for implementation, and then there are software vendors that will come out and install the stuff for you. A couple do both – but they aren’t as good as the ones who specialize in certain area. Below we will review the biggest RPA vendors in each camp. Accenture, IBM, and Deloitte all pride themselves in being the best integration and IT implementers on the planet. We call them full suite firms. But, if they are so good at IT integration and implementation, then why is there even a need for robotic accounting to fix where their past integration projects fell short? We will talk about that in later posts. Here at The Lab Consulting, we have templates and 25 years of experience in lean implementation and RPA experience for finance operations at a huge scale – think “biggest retailer in the world” scale. We focus on the nuts and bolts, the non-core technology aspect of process analysis and improvement. White collar work standardization is a big part of our work. We take an “a la carte” approach to our RPA mapping and finance operations work. We like to start small, do good work to prove that we know what we are doing. Remember the bionic arm approach we mentioned earlier? That’s the kind of work we can do reliably within a couple of days to get clients used to the idea of robotic accounting. Then we scale up to more work once we get in a groove with our clients. We come to the table with tons of template-related IP from past work experience to reduce RPA implementation cycle times. 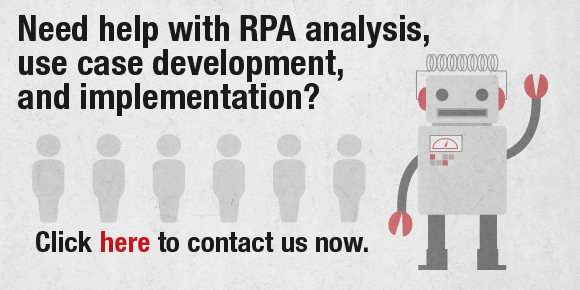 Contact us now to speed up your RPA efforts. Our team is ready to help.